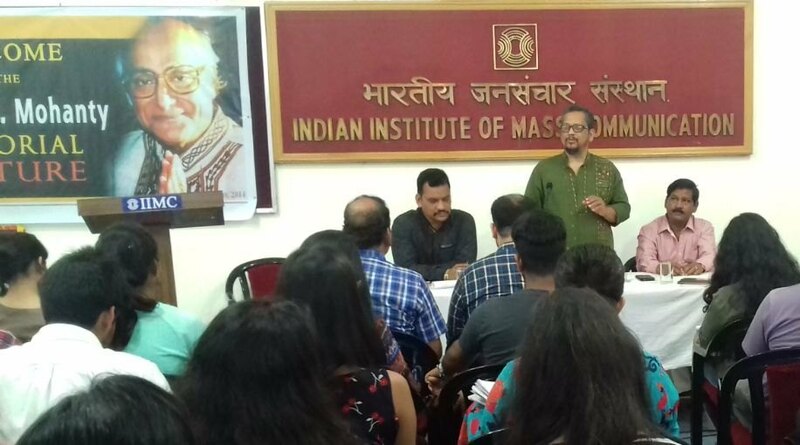 Dhenkanal: The Indian Institute of Mass Communication (IIMC), Dhenkanal on Wednesday organised a special lecture in the memory of Professor B.B. Mohanty here in the campus. Founder of Natya Chetana theater group Dr. Subodh Patnaik deliberated on the topic “Theater for social development” on this occasion. “Theater, as an art form, not only entertains the masses, but also educates them. This not only spreads awareness regarding several important issues, but also reiterates the idea of the struggle between good and the evil. It inspires the common people to be a better persons,” he said. He also said that theater and cinema can convey a message only if it is realistic in nature. “In our commercial films, heroes usually do things which can’t be done by a common man. They defy rules of physics and there is hardly any logic behind the plot. This is the reason why they fail to convey a message and inspire the audience as the viewers know that they can’t become like their heroes,” he added. Prof. B.B. Mohanty, the first Prof-in-Charge of IIMC, Dhenkanal had passed away on 23 November, 2014 in Cuttack. All the faculty, staff members and students paid homage to the departed soul on his third death anniversary. An admirer of classical and folk music and theater, Professor Mohanty had always encouraged the students to participate in theater and musical activities. He even arranged special music classes in the campus when he was in charge of the institute. In order to pay him a suitable tribute, the institute had invited renowned theater artist, play-write and founder of Natya Chetana, Dr Subodh Pattnaik to deliver a speech. Later in the evening, famed artist of the group Sujata Priyambada presented Fakir Mohan Senapati’s ‘Rebati’ in form of monodrama.